OSWEGO, N.Y. -- Rachael Farmer of Grand Island has been selected by The Northeast Women's Hockey League (NEWHL), Oswego State's athletic conference affiliate, as an Athlete of the Week for the week ending Nov. 11. The conference seleceted Rachael Farmer as its Goalie of the Week, and Avery Webster as its Rookie of the Week. Farmer, a junior transfer, recorded 60 saves in her first two starts as a Laker. In Friday night's matchup at Buffalo State, the goaltender recorded 26 saves in the Lakers' 2-0 victory, solidifying her first shutout in green and gold. In Saturday's 1-0 win, again at Buffalo State, the Grand Island, N.Y. native recorded a season best 34 saves. 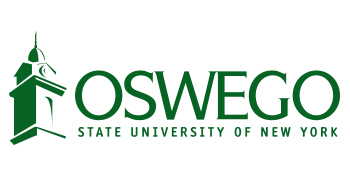 Of those 34, 26 came in the final 40 minutes and 18 were during penalty-kill situations, allowing Oswego to score a late goal for a 1-0 triumph. Webster was instrumental in the team's 1-0 win over Buffalo State on Saturday, scoring the game-winning goal with less than three minutes remaining in the final period. The defender's goal was aided by Eryn Stewart and Kate Randazzo. The Waterloo, Ont. native is tied for first on the team in goals (3) and in the plus/minus category (+8), while tying for second in points (5). Farmer, Webster and the Lakers return to action at 7 p.m. on Friday night as they host Cortland for their home-opener and "Pink the Rink" game.